Stricter measures will be considered at the Grand National meeting if racing's rulers are unhappy with whip use by jockeys at the Cheltenham Festival. Riders will be "reminded of their responsibilities" before this month's four-day festival and required to attend daily briefings before racing. In December, the BBC revealed stronger deterrents to jockeys breaching the whip rules were being discussed. On Friday, it emerged that whip rules in Ireland are to become tougher. 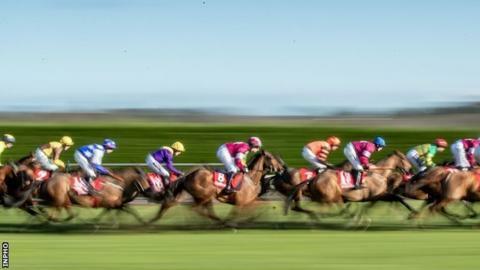 The indiscretions increased by 26% to 213 in 2018, prompting the Irish Horseracing Regulatory Board (IHRB) to look into measures which will include a limit, for the first time, on how many times a jockey can use the whip. Despite many people within racing insisting that modern air-cushioned whips do not hurt horses, it is seen by senior figures as a potential negative in attracting a new audience to the sport. It is understood that British racing, which is facing growing political pressure from MPs on the issue, is preparing for a possible ban on the use of the whip for encouragement within three years. A spokesman for the British Horseracing Authority said: "Jockeys will be reminded of their responsibilities in regards to the whip in the build-up to the Cheltenham Festival (12-15 March) and at the new, mandatory daily briefings. "If it is felt necessary following the Festival that temporary measures should be considered to provide a greater level of deterrent to riders, then broader penalty provisions may be put in place." If required, those measures would be introduced before the Grand National meeting at Aintree from 4-6 April. "More generally the BHA is aware that the whip continues to be a topic of debate, we are alive to that debate and listening to it with interest," added the spokesman. "The sport is currently developing an industry-wide welfare strategy which will include further consideration of the use of the whip in British racing. "We also note that Britain's approach to the whip was recently endorsed by UK government who stated that it is 'satisfied that the rules in place are sufficient to restrict and limit the use of the whip in horse racing'." Since new whip guidelines were introduced in British racing in 2011, the number of rule breaches annually by jockeys has halved on average - falling from a total of more than 1,000 to nearer 500 last year. "Banning the whip won't make a blind bit of difference to welfare but we can all see the direction of travel," Professional Jockeys' Association boss Paul Struthers told the BBC in December. Earlier this week France Galop announced a new maximum permitted number of five strokes, just two years after coming down from eight to six. Highly competitive races such as the Cheltenham Gold Cup have seen winning riders given subsequent bans for breaching the regulations. Champion jockey Richard Johnson won last year's Gold Cup on Native River after an epic duel with runner-up Might Bite. But Johnson was punished for misuse of the whip during the showpiece race - and was given a seven-day ban and a fine of £6,550. Many within racing regard the issue of racehorse fatalities as far more important than debate around use of the whip. Extra veterinary checks, alterations to some race conditions and a major project to study faller rates were among recommendations from a BHA review after seven horses died following injuries at last year's Festival. Denis Egan, the IHRB chief executive, expressed disappointment at the increase in the number of whip rule breaches in Ireland, which are now at levels last seen before new rules being introduced in 2013. He said: "The IHRB will be introducing more stringent whip rules in the coming months and for the first time there will be a restriction on the number of strikes allowed. "There will also be higher penalties for frequent offenders."